Some of the emperors of ancient Rome's behavior was so cruel and eccentric that they have come to be known as "mad emperors" and likened to "psychopaths". 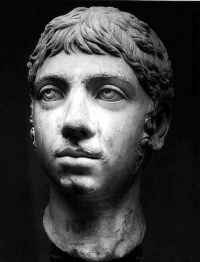 They include these five : Caligula, Nero, Domitian, Commodus, and Elagabalus. Unless indicated otherwise, the text in this article is either based on Wikipedia article "Emperor" or another language Wikipedia page thereof used under the terms of the GNU Free Documentation License; or on original research by Jahsonic and friends. See Art and Popular Culture's copyright notice. This page was last modified 09:39, 17 November 2013.